Cocoa has a home! 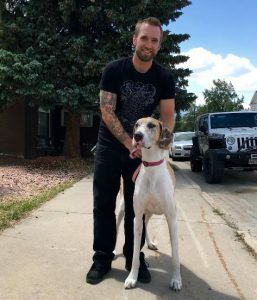 - Rocky Mountain Great Dane Rescue, Inc.
Cocoa has a home with Uriah in Dolores, CO. His love for giant breeds has increased over the years…especially with having met some Great Danes at friends’ houses. He is looking forward to the companionship and love that a Great Dane will bring him. Cocoa will be an only dog and have loads of undivided attention. We are so happy for you both! Way to go Cocoa!